Our community has some seven acres held in common. We've decided to investigate its food producing potential in the most efficient manner possible. Those of you who have heard of Permaculture know that this system fits the bill perfectly. Consequently we had an expert in the field visit and produce a report on how we might put this into effect. I'm going to reproduce some of the high points from this report below, as I believe it will be useful information for other mountain dwellers. First, our local terrain is classed as Zone 4, which refers to steep sloped mountain territory. This really limits the use of the land to arboreal production, basically fruit and nut trees along with edible palm products, mixed with native trees which may in the future provide wood products. Much of this has now been accomplished, and we just to wait a year or so more for the first mangos to fruit. 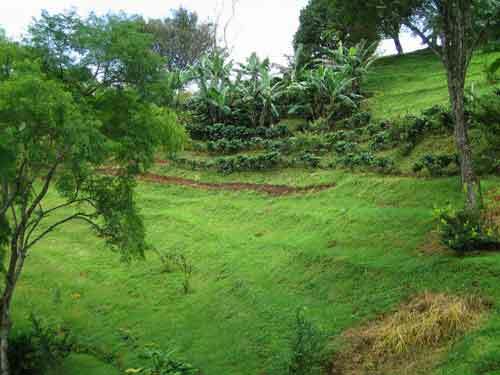 This year will provide a sizeable harvest of coffee, and we have already papaya and banana in abundance. In our tropical zone bamboo for construction is also a useful feature. This takes root very rapidly and produces shoots with a year or two of planting. 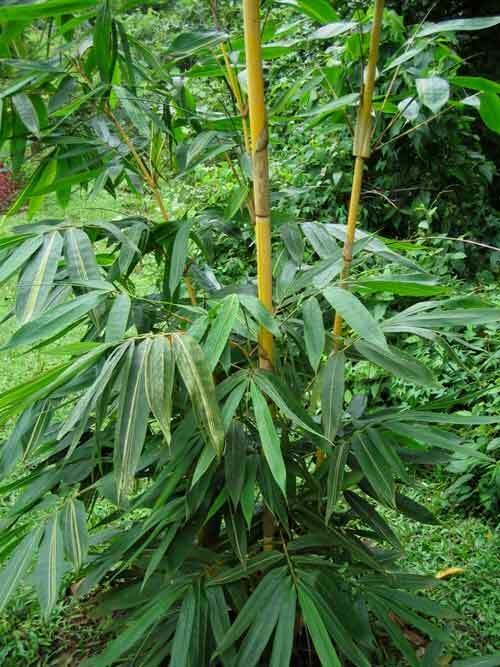 Currently we have five different species of bamboo growing, including a giant construction bamboo. Now the idea of a permaculture cultivation in an area like ours is to place the food producing trees close to pathways to make them easy to harvest and maintain. As I can attest, climbing up a steep slope with a heavy bunch of bananas on your back is not much fun. 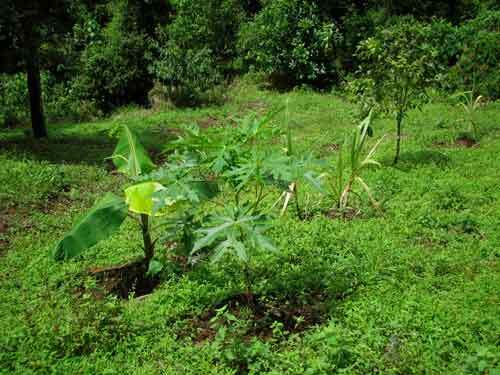 Plaintain, papaya and sugar cane planted close to the pathway. Close to the pathways one makes small terraces in horizontal rows, making it easy to walk along them and also reducing the forces of erosion, always extreme in the mountains. In this way its easy to reach the trees, pick the fruit and move around between them. 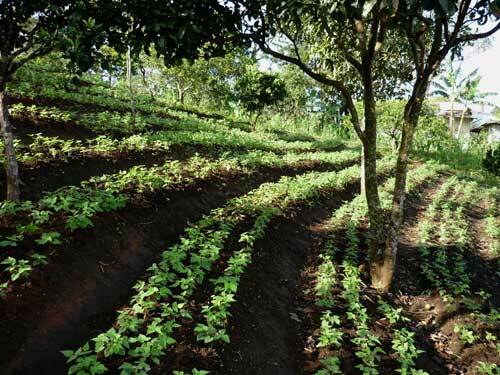 Below these areas we have natural secondary forest growing, and the natural seeding from these regions will gradually mix with the transitional area to provide a greater biodiversity of bird and animal life. 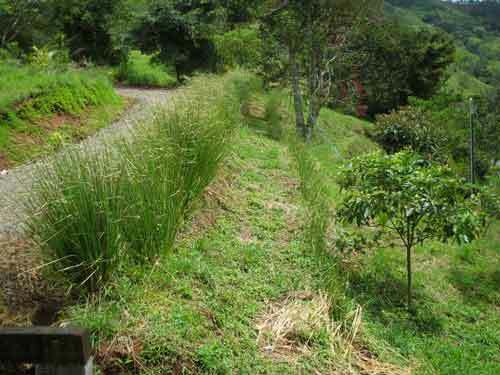 Where there have been cuts in the hills to make pathways or roads, and resulting in a fresh earthen embankment, a particular grass called maincillo is an excellent choice for erosion control. As well, this is a legume which fixes nitrogen into the soil. Another possibility for soil stabilization is vetiver grass. This is a hardy drought resistant clumping grass whose roots may extend up to three meters into the ground. You get this penetration by continually cutting back the clumps as the grass grows tall. This sends the roots deeper. Vetiver has the additional advantage of being the source of a very valuable essential oil, used as a base note in the perfume industry and as a healing oil in massage. The only caveat about Vetiver is that it needs to be cut back on a regular basis. If not the tall grass provides a welcome home to snakes. 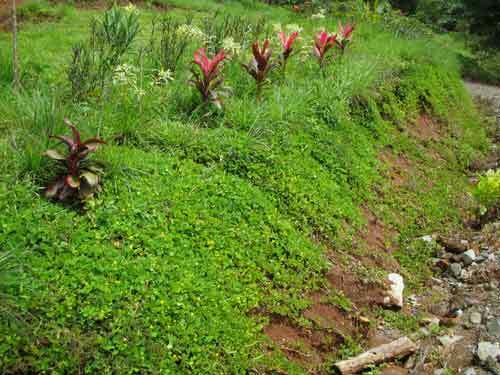 A good deal of the permaculture report was focused on soil regeneration and the various methods of doing this. In our area most of the soils have been depleted by rather brutal treatment over the decades, and subsequent erosion has stripped off the topsoil right down to the red clay below. However, the good news is that regeneration of humus proceeds rapidly if given a boost by composted soils, use of Efficient Microorganisms and erosion controls are put in place.